Life of a Catholic Librarian: What's new with Anne? (1) Raking. You know how babies do, with their fingers, to feel textures? It's adorable. Unfortunately, she disturbed my drying pile of freshly blocked hand knits the other day doing this, but she looked so proud of herself, how could I begrudge her? 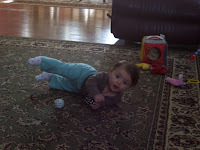 (2) Crawling. Sigh, yes. She really gets around now. And where does she head first? That's right, the electronic equipment. Has this been bred in via evolution? It seems that every human baby, upon gaining mobility, will immediately set upon trying to stick their fingers in the DVD player and press buttons on the stereo. And the DVD cases, FOR THE LOVE OF ALL THAT IS HOLY. These, and books. 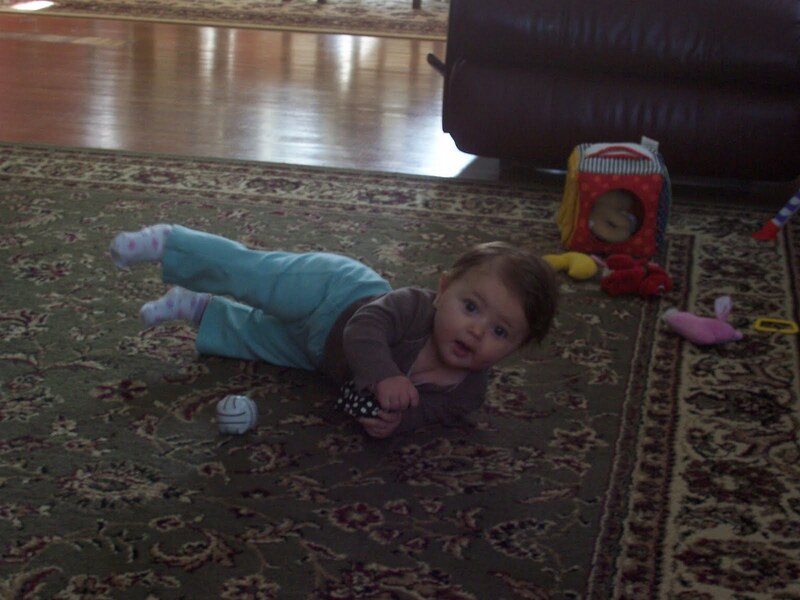 When set down on the floor, all babies will immediately take off for these destinations and thereupon delight in plucking the items off the low shelves and tossing them about gleefully. (3) Separation anxiety. If you set her down and leave the room for a moment, an immediate bursting into tears can be heard. "Why did you leave me, you're gone!" The instant you reappear, a big smile comes up, along with a squeal. "You're back, I'm SO HAPPY!" It's precious. When she woke up in her crib this morning, I couldn't wait to pick her up and kiss her face. That warm morning snuggle is always the absolute best, no? Unfortunately, she had managed to spring lose of one diaper fastener, so she had peed all over herself and her crib sheet, but no matter. I just adore her so.